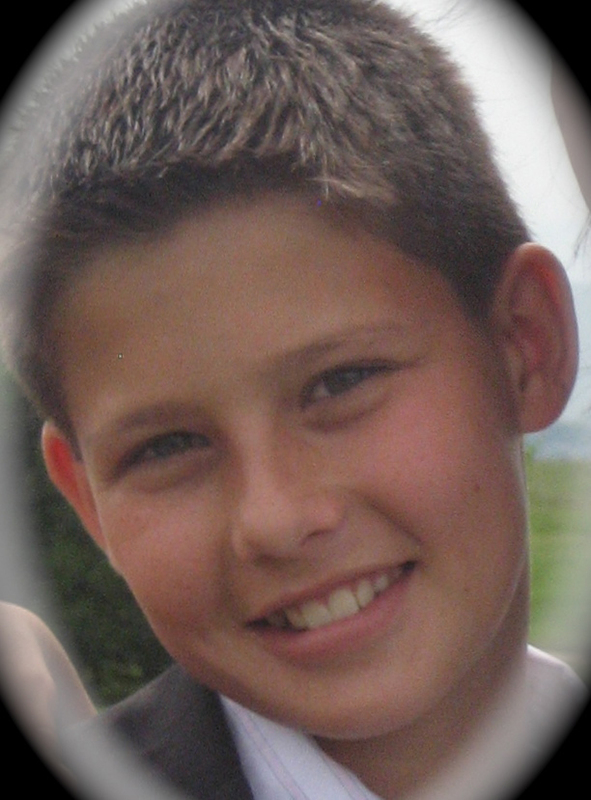 Alex Sabados, 14, died March 24, 2010 at his home following a brief and courageous battle with cancer. He was born February 26, 1996 in Boulder to David and Julia (Stepniowska) Sabados. Alex attended Berthoud Elementary school and was currently in the 8th grade at Turner Middle School in Berthoud. Alex was a member of St. John the Baptist Catholic Church, Longmont, the Boy Scouts of America Troop 6 in Berthoud, and RMR BMX Team in Berthoud. A wonderful, fun loving and happy boy, his family remembers him in many ways. Alex was a jokester and loved to make people laugh. Even in his illness, he would wear a special tie and clown nose to the clinic at Children’s Hospital for the enjoyment of the others. He really liked to tease his sister. Alex also had a deep caring side, with a big kind heart as he always looked to help others before thinking of himself. He never missed a chance to smile or passed up the chance to treat someone with kindness and was well-behaved, sweet, considerate and loved by everyone. Alex loved adventures and the outdoors, especially any outdoor sport. He participated in BMX bike racing and played competitive soccer with Storm North. He also enjoyed skiing, fishing, hunting and hiking. He dearly loved his family, especially his ‘Babcia’. Alex is survived by his parents Dave and Julia, his sister Maria ‘Mia’ Sabados and her friend Levi Heath, grandparents Maria (Babcia) and Michal Stepniowscy, several uncles and aunts: Waldek and Tammy Stepniowski and their sons Michael and Tyler; Chris and Dawn Banas, Twila Sutton, Charles Sadados and Mark and Pam Sabados and their families. He is also survived by many friends, to whom his family express their love and gratitude for the great support given over these last few months. Mass of Christian Burial will be 10:00 a.m. Saturday, March 27, 2010 at St. John the Baptist Catholic Church, Longmont. In lieu of flowers memorial contributions to Pathways Hospice, Brent’s Place or Ronald McDonald House can be sent in care of Ahlberg Funeral Chapel. Visit www.ahlbergfuneralchapel.com to leave condolences for the family.